This list is by no means comprehensive right now and will be added to as this site develops. The list is alphabetical based on surnames. Those with longer entries have done all or most of the above! Francesca Anderson at the Johnathan Cooper Park Walk gallery exhibition for the 25th anniversary exhibition of the Shirley Sherwood Collection. A botanical artist who always works in pen and ink. She has received two RHS gold medals (Amaryllis in 1995; Brassica series in 1998). She is a former President of the American Society of Botanical Artists, founder and president of the Brooklyn Botanic Garden Florilegium Society, a Fellow of the Linnean Society and and a Trustee of Brooklyn Botanic Garden. She has ​had her work exhibited internationally in museums in Sweden, Scotland, London, South Africa, Australia, Berlin, and Japan. Her work is in the collections of work the the Shirley Sherwood Collection, Smithsonian National Museum of Natural History, the Hunt Institute, the RHS Lindley Library and the National Gallery of Modern Art in Scotland as well as other public and private collections. ​Founder of the American Society of Botanical Artists (ASBA). She studied scientific illustration at Harvard’s Peabody Museum and botanical illustration at The New York Botanical Garden (Certificate 1994). Her preferred media initially was watercolour and gouache and then coloured pencil and egg tempera. She has exhibited widely. Exhibited Hippeastrum (two studies) at the 8th International at the Hunt Institute for Botanical Documentation. Her work is in the collections of the Brooklyn Botanic Garden Florilegium and the Hunt. Also the Professor of Sociology at SUNY Stony Brook for 18 years. ​Bachelor of Fine Arts from the Fashion Institute of Technology in New York. Started painting botanical art in 2008 and works in watercolour and gouache. Her work is included in the permanent collections of the The Hunt Institute for Botanical Documentation. Huntington Library and private collections. Regularly exhibits with ASBA and at Filoli. RHS Best Botanical Painting in 2011 for one of her Common mushrooms of the Pacific Northwest, United States. Her 2005 GM was for Pacific Coast Irises. the ASBA 2005 Diane Bouchier Founders Award for Excellence in Botanical Art. Jean Emmons with the painting which won "Best Painting" at the RHS Botanical Art Show (March 2011). Part of a display of 'Common mushrooms of the Pacific Northwest, United States'. ​Her work is in the collections of the Shirley Sherwood Collection, Hunt Institute for Botanical Documentation, Denver Botanic Garden and Brooklyn Botanic Garden. Chief botanical illustrator for the Flora of Virginia Project. RHS Gold Medal winner in 2007 for a very impressive series on Plants of Virginia - 10 Walks in Virginia which is one of my 'all time favourite' exhibits. She also works in pen and ink and won a second RHS Gold Medal for Seeing Plants; a year in Virginia" - her suite of 12 sepia watercolour paintings of plants she has found on her walks in different months of the year. She frequently draws and paints a compendium of plants with a particular connection eg habitat or season. A botanical artist, illustrator, author, and instructor who works predominatly in coloured pencils. Member of the American Society of Botanical Artists and the Brooklyn Botanic Garden Florilegium Society. Her work was included in the 13th International Exhibition at Hunt Institute for Botanical Documentation, and in exhibitions at the Royal Botanical Gardens, Kew, and the Smithsonian National Museum for Natural History. She is also an an instructor of Botanical Art and Illustration at the New York Botanical Garden and the author of the author of Botanical Drawing in Color: A Basic Guide To Mastering Realistic Form And Naturalistic Color and Botanical Drawing: A Beginner's Guide. See details of the author above. The book also has lots of exercises and discussion of art supplies. Degree in biological illustration from Iowa State University. Member of the Guild of Natural Science Illustrators (GNSI), and the Nature Artists Guild of the Morton Arboretum. Exhibited at the 12th International of the Hunt in 2007. Specialises in the use of graphite pencil for her botanical artwork. She has received numerous awards - including five Gold Medals from the RHS. Has work in the Hunt, the Brooklyn Botanic Garden Florilegium, the Alisa and Isaac Sutton Collection in New York, and the Shirley Sherwood Collection in London. ​BFA from Wayne State University. Orchid painter based on Hilton Head Island in South Carolina. Exhibited with the Hunt in the 7th International Exhibition in 1992. Work in the collections of both the Hunt Institute and Shirley Sherwood. Author of Response to Nature about her work. ​Heeyoung Kim won an RGS Gold Medal (Plants of the American Prairie - a series of 8 watercolour paintings) and a number of other awards. 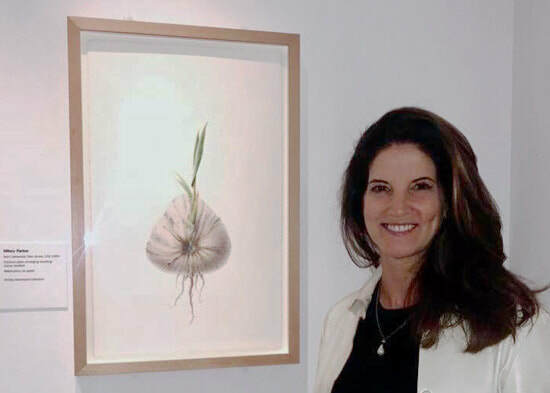 In 2012, she also won the Best in the Show at the 15th International Exhibition (2012) and the Diane Bouchier Artist Award for Excellence in Botanical Art. She's a member of The American Society of Botanical Artists and The Reed-Turner Botanical Artists Group in Long Grove, Illinois. She specialises in drawing American Prairie Plants. (see imagebank). She was also invited to contribute three works to The Transylvania Florilegium. Trained as an illustrator at the School of Visual Arts. 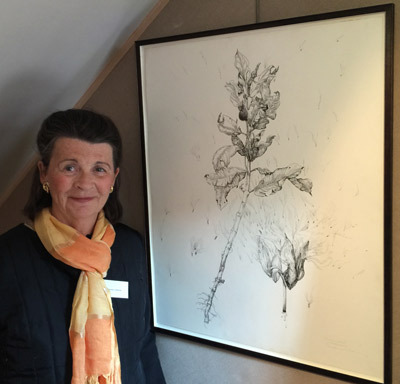 She has won the Best in Show Award at the International Exhibition twice (2008 and 2010) and the Dianne Bouchier Award For Excellence in Botanical Art, 2010. Her work was exhibited at the Hunt Institute in 1999. Graduate of the New York Botanical Garden Botanical Illustration program, Katie went on to become an instructor at NYBG for 20 years. Work in private collections in England, Australia, the United States of America and South Africa. including those of Shirley Sherwood and Alisa and Isaac Sutton . Author of 'Fundamental Graphite Techniques' - see below. Professional scientific illustrator. Lead illustrator for Flora of North America Volume 9: Rosaceae and Vol 13 Magnoliophyta. Also provided illustrations for volumes 6, 12, 19, 20, 21. Just about to start on the Flora of Oklahoma. She has also worked on other volumes and has produced over 180 plates. Illustrator of field guides. Lead instructor, Denver Botanic Garden School of Botanical Art & Illustration 1990-date. 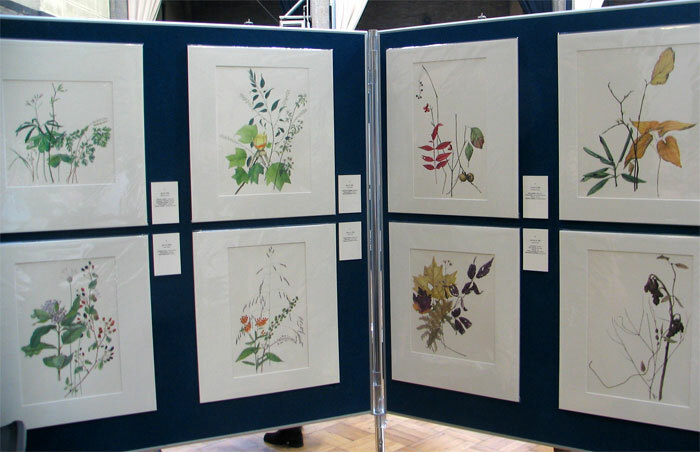 ASBA Botanical Illustrator Award for Excellence in Scientific Botanical Art (2012). RHS Gold Medal (Group) 2017. Based in Colorado. ​he first time I became acquainted with this book was at the Chelsea School of Botanical Art where the book is imported and sold to students as a basic text book. Katie Lee is a graduate of the New York Botanical Garden Botanical Illustration program. She has been an instructor at NYBG for 28 years, at Coastal Maine Botanic Gardens for 12 years and has taught at various venues internationally. ​The author creates natural history art as well botanical art - hence the bird on the cover. It's particularly relevant to those who are also like doing both natural history and botanical art. 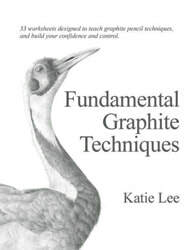 HIGHLY RECOMMENDED: The book is all about graphite and nothing but how to draw using graphite! I'm impressed with the quality of instruction which is much better quality than many other books which reference graphite as a drawing medium. The worksheets are very precise and provide step-by-step instructions. Note that the book is spiral bound - which is a joy when you want a book to lie open and flat so you can follow a worksheet! This book has never been listed on Amazon by the artist. However new and used books are listed by third parties for ludicrous sums from time to time - check them out below! Born in Lakewood, New Jersey in 1964. She has been an artist and a teacher for over 30 years having graduated from Florida International University with a B.S. Degree in Art Education. She has delivered botanical workshops in botanical gardens across the USA and in Australia. She has exhibited at the Hunt International and at various venues in the USA, UK, Australia. She has artwork in the Shirley Sherwood Collection. Her coconut palm was displayed as part of the Trees: Delight in the Detail (Oct. 2018-March 2019) exhibition at the Shirley Sherwood Gallery of Botanical Art. Staff illustrator in the Department of Botany at the National Museum of Natural History, Smithsonian Institution, since 1972. (Examples of her work). She specialises in monochrome illustration and lectures and teaches about scientific botanical illustration. See her 900+ pen and ink botanical illustrations on the Smithsonian database - put her name in the Artist cell on this search enquiry. 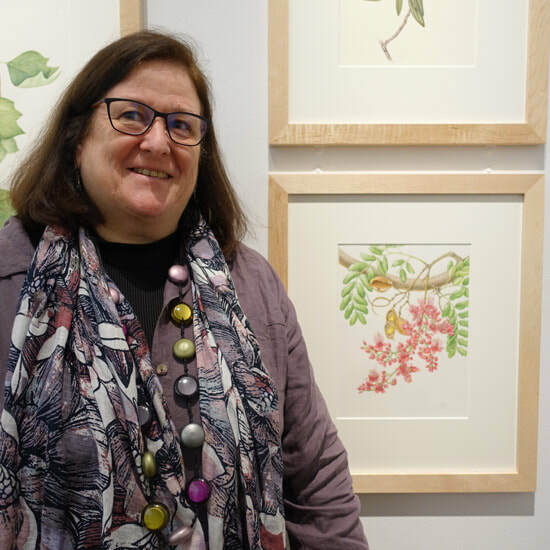 A professional botanical artist (represented by Susan Frei Nathan) who has been the Director of Exhibitions for the American Society of Botanical Artists since 2005. Specialises in painting rare plants in watercolour on vellum. She has been awarded an RHS Gold Medal and the Diane Bouchier Award. 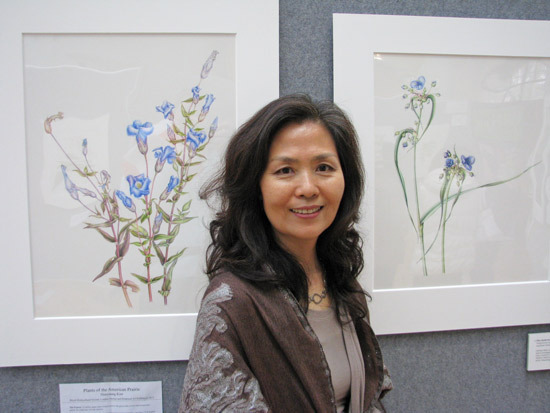 She is also the first botanical artist to receive the Orchid Digest Medal in 2016 for “meritorious service to the orchid world.” Her work has been published in Curtis Botanical Magazine and various scientific publications and is in the collections of Smithsonian National Museum of Natural History, Royal Botanic Gardens, Kew, Dr. Shirley Sherwood Collection, and Alisa and Isaac Sutton. ​​This photograph was taken at the exhibition to celebrate the 25th anniversary of the Shirley Sherwood Collection at the Jonathan Cooper, Park Walk Gallery in Chelsea. ​You can read the e-catalogue of the exhibition. 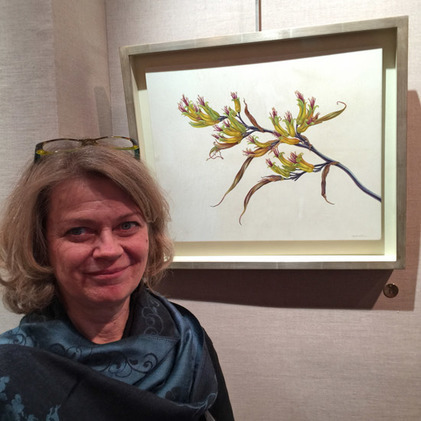 Carol Woodin with Phormium sp (watercolour on vellum over panel) at the exhibition to celebrate the 25th anniversary of the Shirley Sherwood Collection. This is a compendium of contemporary botanical artists currently living and working in the USA around the second millennium. A more accurate title is "Botanical Artists of Today living in the USA" as it doesn't include leading artists living elsewhere. It includes 65 artists and 220 drawings and paintings. Each artist has a double page spread for a short statement about their work plus three or four images. However in an appendix there is also a useful and comprehensive datum for each artist relating to selected exhibitions, collections, memberships, awards etc as at the date of publication.. It also includes the price of paintings in the book and contact details. The landscape format suits some of the images particularly well whereas other portrait format images are rendered smaller than I'd have like to see. The quality of the images seems to be influenced by the quality of the scan or photograph provided by the artist as there is some variation in quality - however most are excellent. Sherry is a watercolour botanical artist, specializing in the native flora of British Columbia, Canada. Her work is included in the Hunt Institute for Botanical Documentation. Born, raised and educated in South Africa where she trained as an art teacher. Worked in various countries and settled in the Rockies in Canada in the 80s. Has work in the Hunt Institute of Botanical Documentation and Royal Botanic Gardens, Kew and numerous private collections. She is also a member of the botanical art societies in Canada, USA, Bermuda, Southern California, Southern Alberta, South Africa, France and the Florilegium Society of the Royal Botanical Gardens of Sydney, Australia. She has been teaching workshops in several different countries for the last 10 years. Her work is in the permanent collection of the Hunt Institute for Botanical Documentation. Her paintings have been juried into 5 International Exhibitions of the American Society of Botanical Artists. She is a a graduate of the Ontario College of Art and the University of Toronto's medical illustration program. Works in oil as well as watercolour.